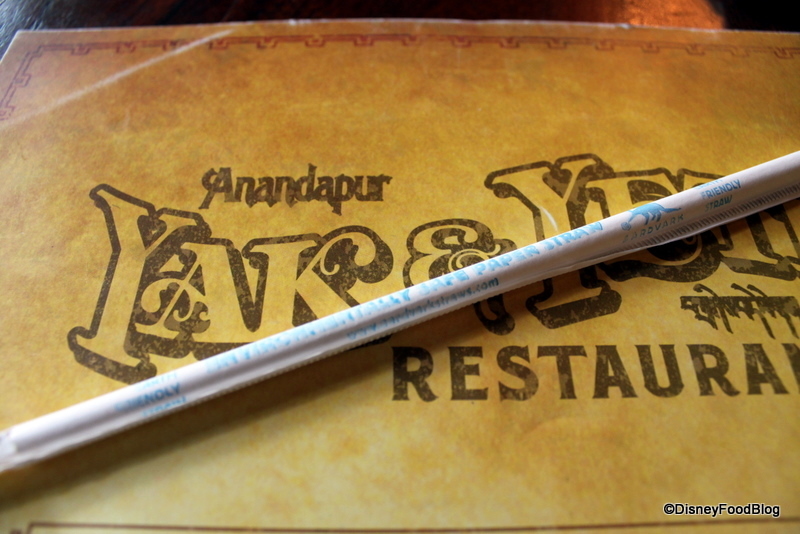 Luckily, I recently got to attend a business meeting at Yak and Yeti in Disney’s Animal Kingdom. I haven’t been there in a while, but I’m pleased to report that this location is still offering great eats for those who want a bit more than pizza and chicken nuggets for their theme park dining. 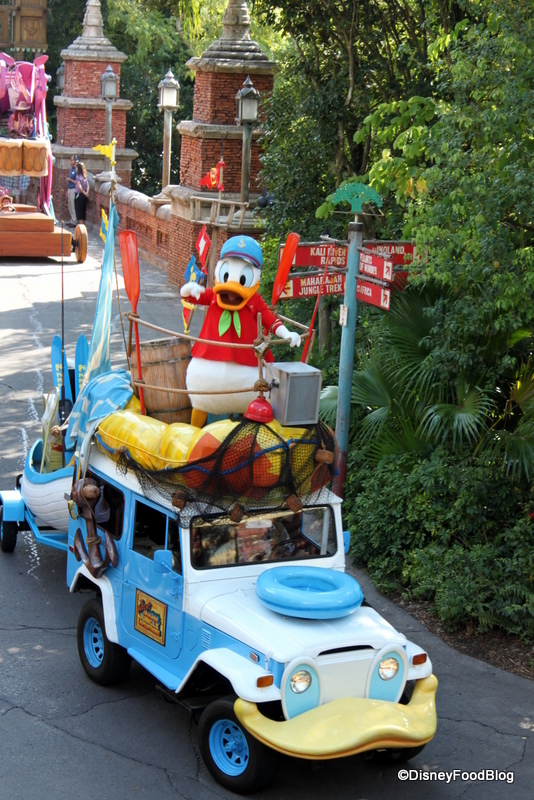 You’ll find this spot in the park’s “Asia” area, near Kali River Rapids. The decor and backstory are a blast, and it’s well worth wandering around the restaurant a bit to take in all of the imagineering detail after your meal. The desire to stand and stare, taking in every detail, begins before you ever enter the Yak and Yeti. The striking purple building beckons you to come in and discover more. 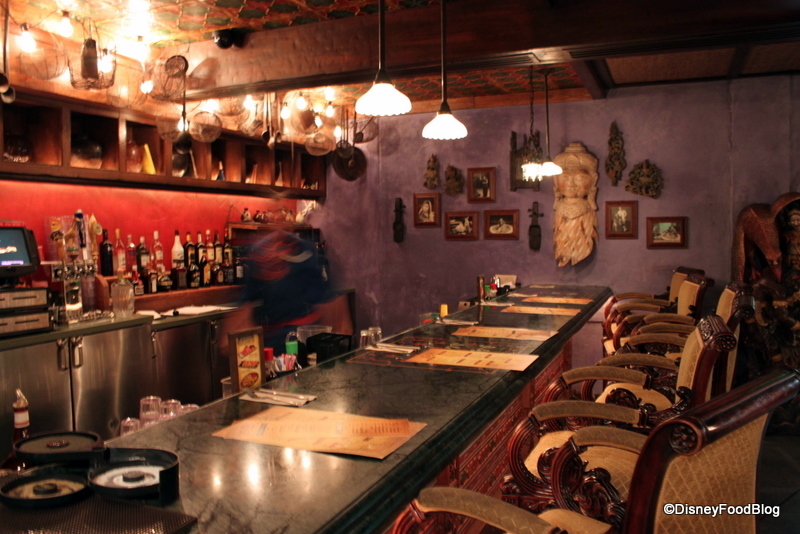 Once inside, you start to peel back the layers of the restaurant’s backstory. 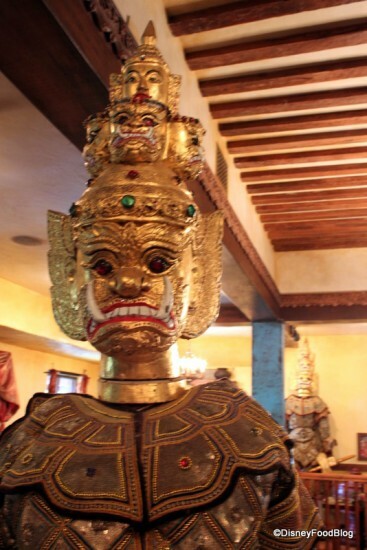 In a nutshell, a wealthy merchant from Anandapur, Arjun, has fallen on hard times. As a result, he’s turned his regal home into a fine hotel and restaurant. You are his honored guests! 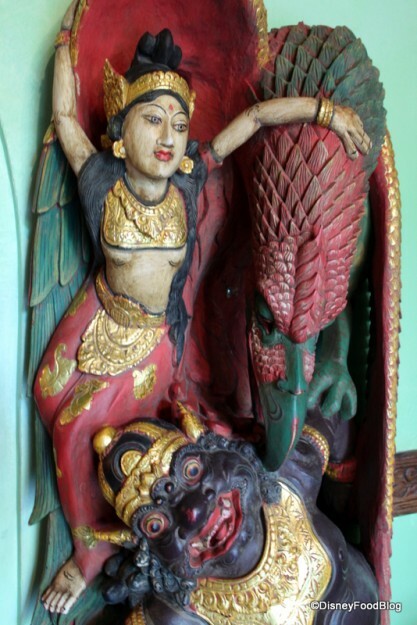 Throughout Arjun’s extensive travels, he’s amassed an impressive art collection. He displays his treasures throughout the restaurant. 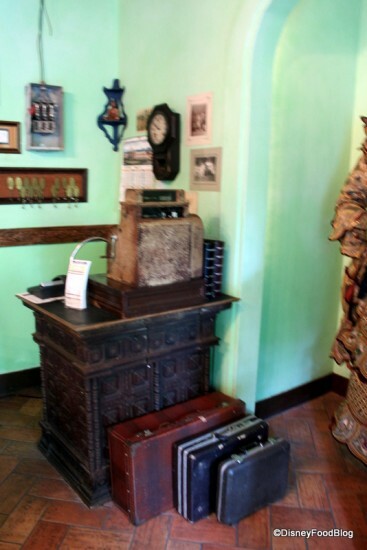 Here, a desk stands ready to greet tourists with the key to a comfortable and well-appointed room. As you walk to your table, check out the relaxed Yak and Yeti Lounge/Bar. This is a great spot to order a full meal or a unique drink if you don’t have a reservation. 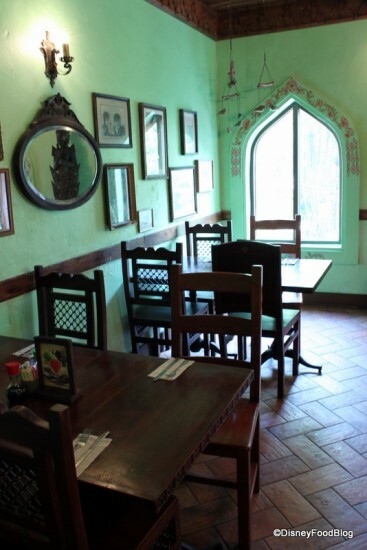 Further into the restaurant, you’ll find that tables and chairs are mismatched to continue the eclectic feel. Be sure to check out the light fixtures, too! Thoughtful detail really does lend to the feel that you’re in a hotel. Too bad we can’t really stay here! I always have to stop and take in this view of the first floor from the second while I’m looking around. I absolutely love it. 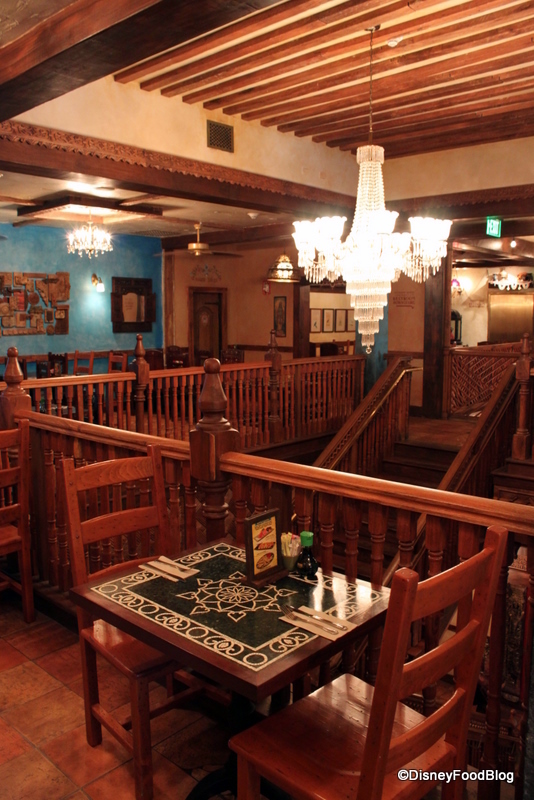 You’ll find seating on both the first and second floor. DFB TIP: And here’s a little secret for you. On days that feature Mickey’s Jammin’ Jungle Parade, book your table around 2:30 or 3:00. When you arrive, request a window view seat on the second floor. 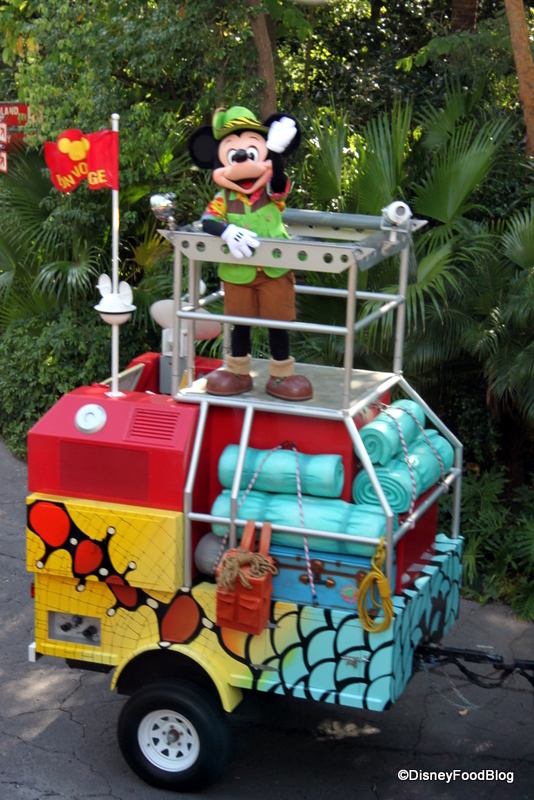 That way, you’ll be comfortably seated with a great view of the parade! But now it’s time to leave the parade behind and focus on the food! 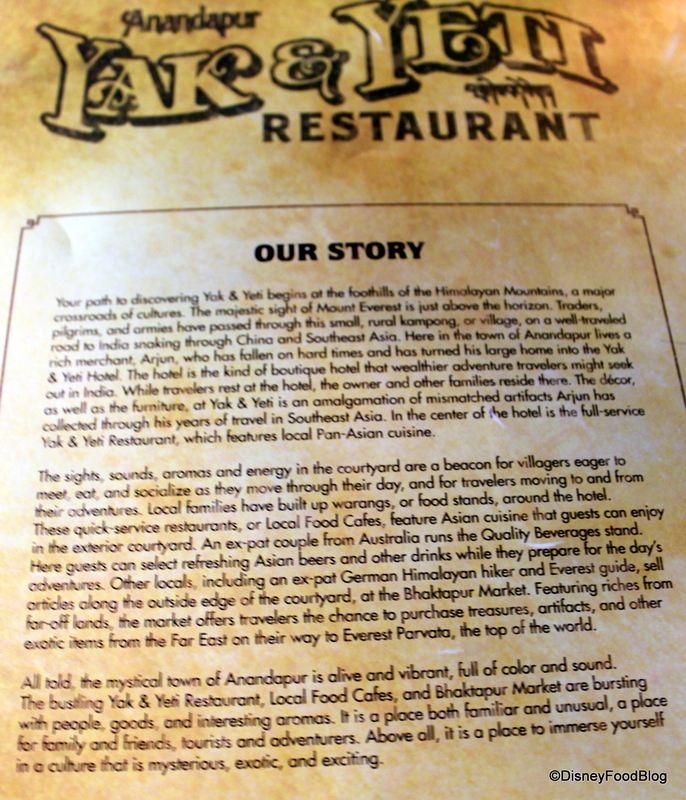 Anandapur, the fictional village in which Yak and Yeti is located, stands at the cross roads of Asian civilizations, so the menu is decidedly Pan-Asian in flavor and influence. 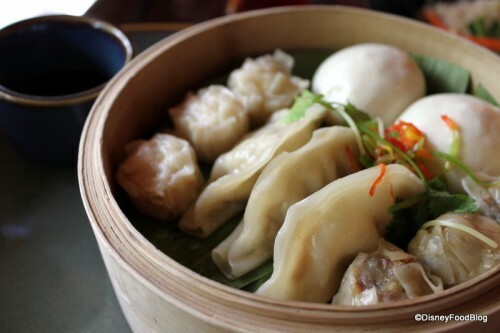 You’ll find dim sum and pot stickers, but those who prefer less exotic fare will find an assortment of familiar flavors as well. The burger is supposed to be awesome (can’t believe I haven’t tried it yet)! The table tent continues the theme, advertising nearby Bhaktapur Market. 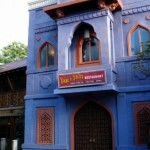 Yak and Yeti is one of the Disney restaurants that’s bringing merchandise inside more and more often. They also have merch for sale in the lobby… . 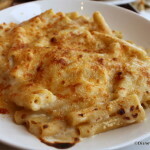 The flipside features some of the spot’s most popular appetizers. 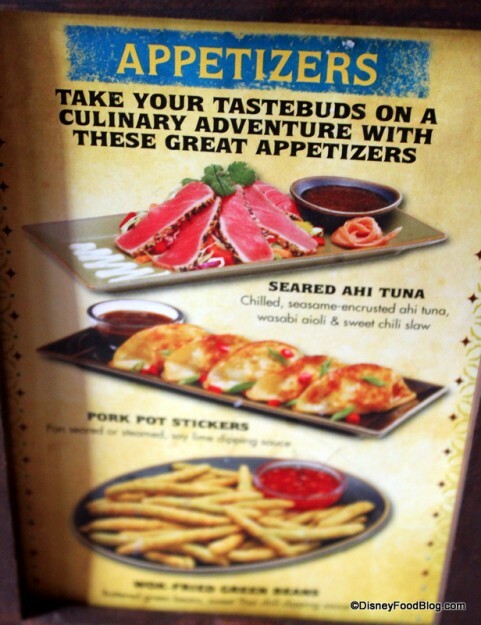 The Whole Fried Green Beans are a guest favorite, and that Ahi Tuna seems new! As you’re ordering, considering some of the fun and unique drinks at Yak and Yeti; but remember you’ll be sipping through a paper straw for the animals’ safety. 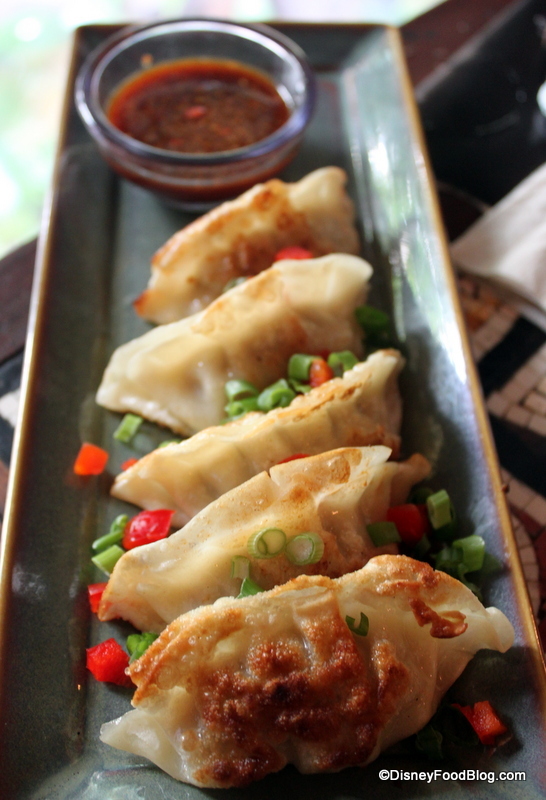 After perusing the menu, we actually decided to go with the Pork Pot Stickers to start. They looked as good as the pic on the table tent! And they were quite delicious with their crisp outside and savory, flavorful filling. 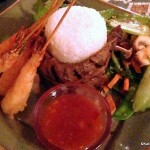 The garnish offered a nice pop of color, and I’m happy anytime there’s a soy-lime dipping sauce involved in my food. We also grabbed that awesome dim sum basket, that’s SO so beautiful. Inside are more pot stickers, Shrimp Siu Mai, Cha Su Bao (barbecued pork buns) and Pork Siu Mai steamed on a banana leaf. Once again, the pork buns and pot stickers were my favorite; but that Shrimp Siu Mai is Pork Siu Mai is growing on me. We made quick work of our appetizers and moved onto entrees. I chose the Stir-Fried Beef and Broccoli, and opted for the steamed brown rice (you can also choose jasmine rice if you prefer it). I always lurve when my food comes at Yak and Yeti. It’s just gorgeous — all the time!! When the food arrived, I took a moment just to admire my plate. 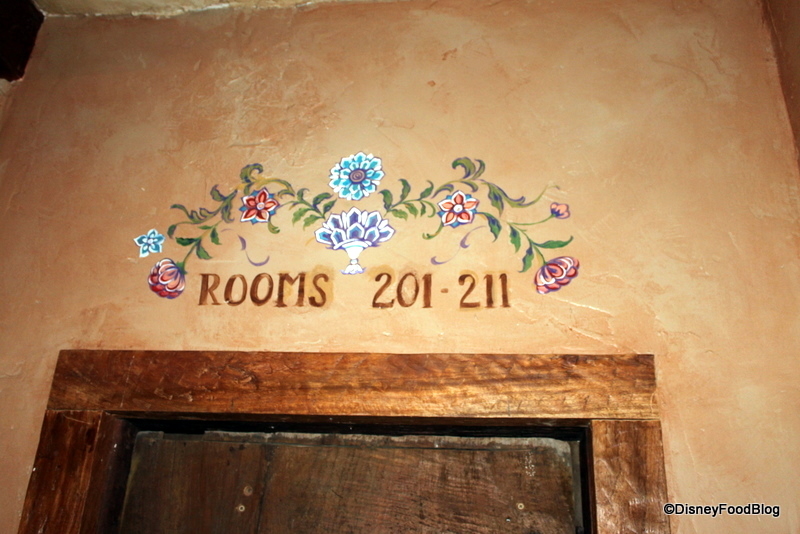 The stoneware really carries the theme of refined rustic. But then, the food! 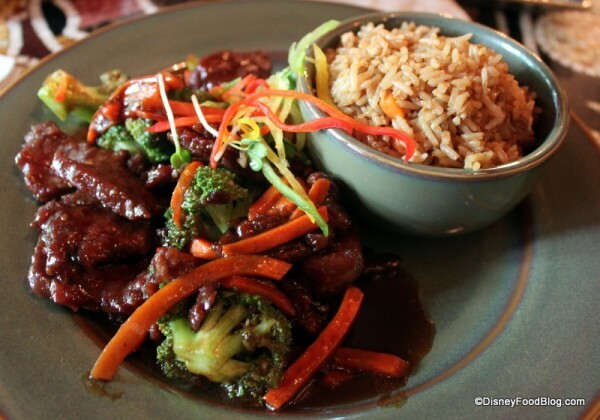 A colorful, generous portion of sauteed flank steak and crisp-tender broccoli and carrots, all in a savory brown sauce. I guarantee I ate this whole thing — even after the appetizers. 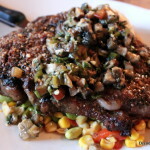 The veggies were crispy and cooked just right, and the meat was hot and flavorful. Nothing bland here — not even the rice! The Shrimp Lo Mein was beautifully presented as well. 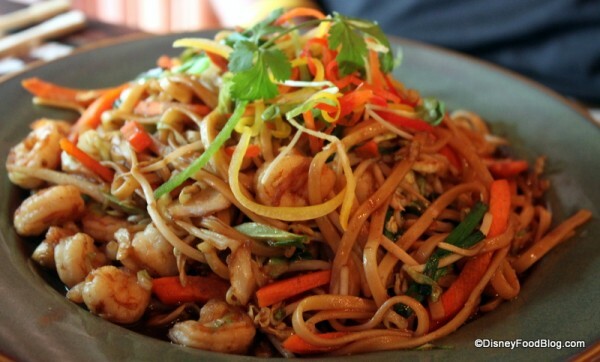 Heaped high with lo mein noodles, the dish was spilling over with shrimp. My dining partner was very pleased with his choice. How was I still eating after all of this?!? Clearly I’ve been in training. ;-D I grabbed the New York Cheesecake for dessert! With its drizzle of mango and strawberry sauce, once again, this is a lovely presentation. 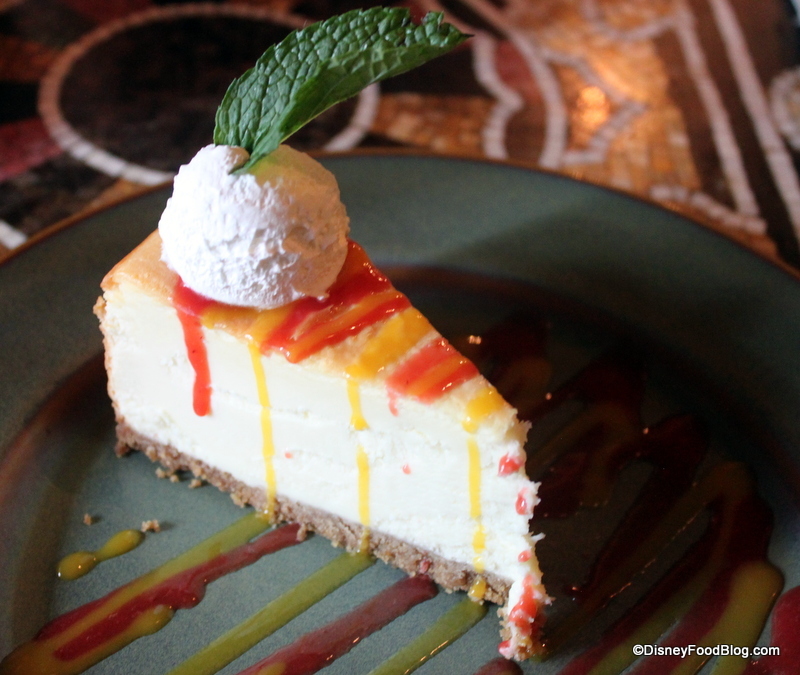 It’s the perfect choice if you’re craving classic cheesecake. P.S. : That little ball on top is whipped cream. 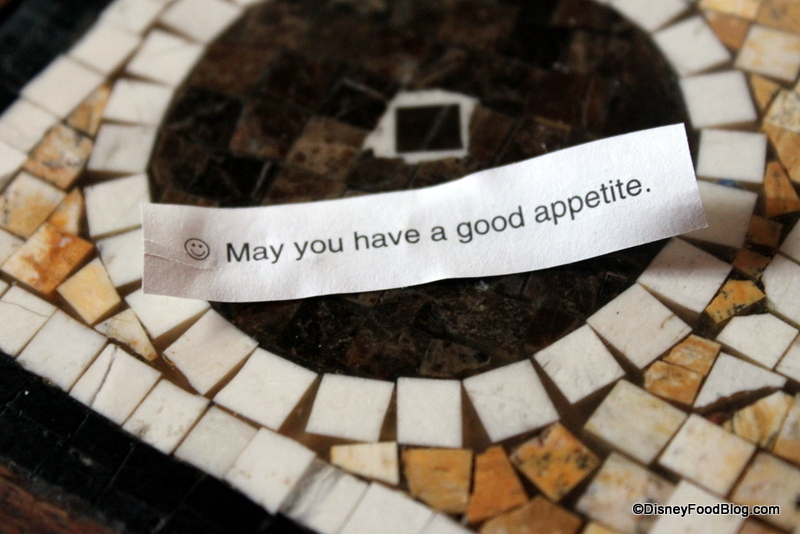 One fun American twist that Arjun observes: you get a fortune cookie with your bill! I thought mine was particularly appropriate. Yak and Yeti continues to impress me. In my previous review of this spot, I mentioned that I’ve always had good food and good service here, and that trend continues. The surroundings are incredible, the food is delicious, and the presentation is thoughtful. That signals a win-win-win for me, personally. And the fact that you’ve got a little-known spot to take in the Jammin Jungle Parade, AND escape the heat, especially during the summer, means that this place really is a gem. Is Yak and Yeti a preferred dining spot for you? Let’s hear about your favorite dishes below! Yak and Yeti is top-o-list for us! Most of my favorite WDW dining experiences are here. We’ve never had a bad or even mediocre meal, and I spend months and months and months dreaming about their Mango Pie! 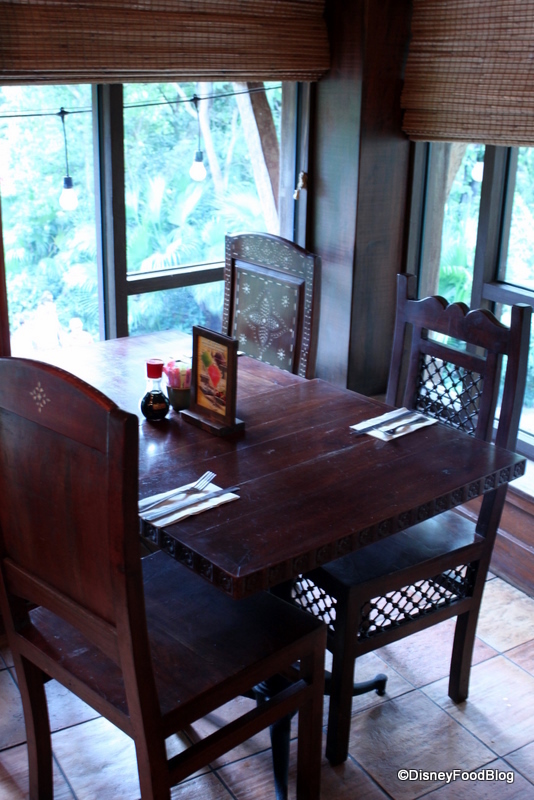 One of their stir-fry dishes is actually from the Rainforest. One of my dad’s favorites, he was so disappointed when it was shipped off to Y&Y. Haven’t eaten there yet, but I can imagine we will soon so he can have it. Our favorite bartender at the Rainforest keeps offering to have the ingredients brought down and have it cooked (he knows my dad loves it) but we don’t like to put people out. But it’s the thought that counts! The review of those lovely dishes makes me sooo hungry but what makes me really jealous is that opening sentence. 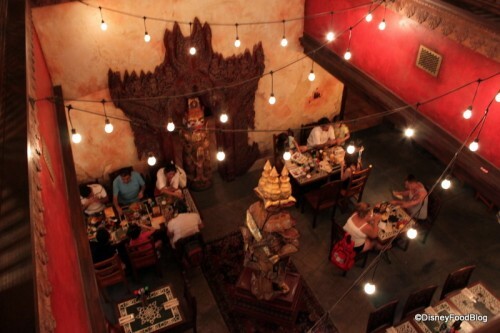 I how I would love to have my business meetings in a WDW restaurant !! You are so lucky. My daughter and I has a wonderful lunch here a couple months ago. I don’t know what was better, the food or our amazing server. I am very happy to learn you can sit at the bar and order off the menu. 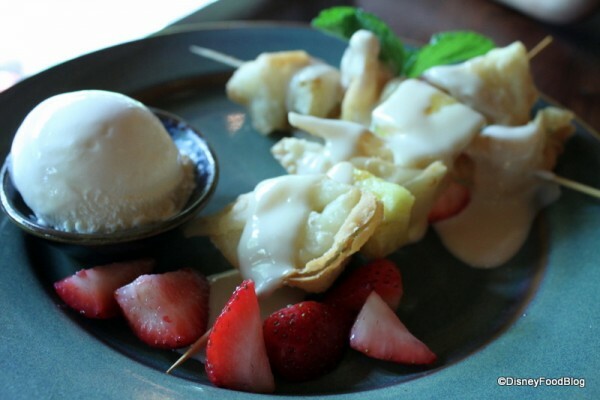 It would be great to just pop in just for a drink and the unbelievable fried wontons dessert. I am not too fond of cream cheese and my daughter is very picky but I ordered the dessert anyway due to all the hype. This is one dish worth the hype! I can’t wait to get it again. Love Yak & Yeti! Favorite dishes thus far are the duck and the bourbon chicken, but now I really, REALLY want to try the dim sum. We stumbled in here on a whim, without knowing much about it, and had one of the best meals of our holiday (miso salmon for me, and a gorgeous salad for him). Definitely one I would now book in advance. We’ve eaten at Y&Y twice and loved it so both times. 🙂 Such wonderful food! Both times we’ve gone, my husband got the baby back ribs. I had the beef and broccoli on our last trip and I loved it. And for me, a trip to Y&Y isn’t complete until I INHALE some fried cream cheese wontons. Thanks for this review! I had avoided Y&Y in the past because I know the guys behind the Rainforest Cafe designed it, not WDW, and I’m probably the only person who doesn’t like the cafe’s food. 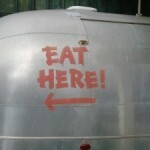 It looks tasty and a worthwhile stop on our next trip! Good solid Asian food. We’ve been there twice in last 3 trips. Always can get a table. We “discovered” Y&Y last fall. 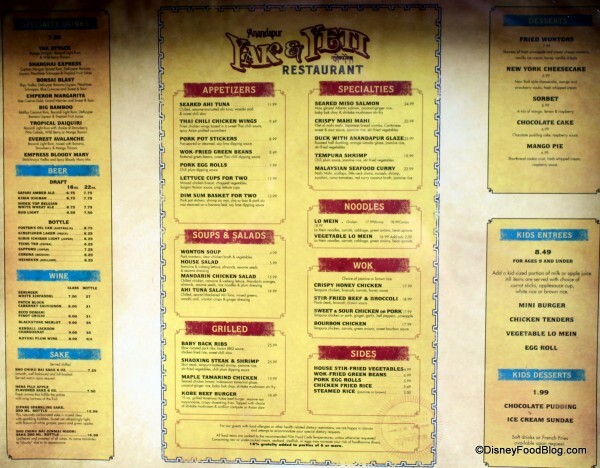 If you are having a sit-down meal in DAK, it is the clear choice. Highly under-rated. We ate there once and I liked the wok fried green beans with chili sauce very much but thought the honey chicken was the most bland thing I’d ever eaten. I’m happy to hear the beef with broccoli was flavorful – think I’ll give that a go if we visit again. Thanks. Just tried this for the first time a month ago and absolutely loved it! The duck was amazing and the vegetables on the side of it were cooked perfectly! Plus I’d take those crispy green beans any day! 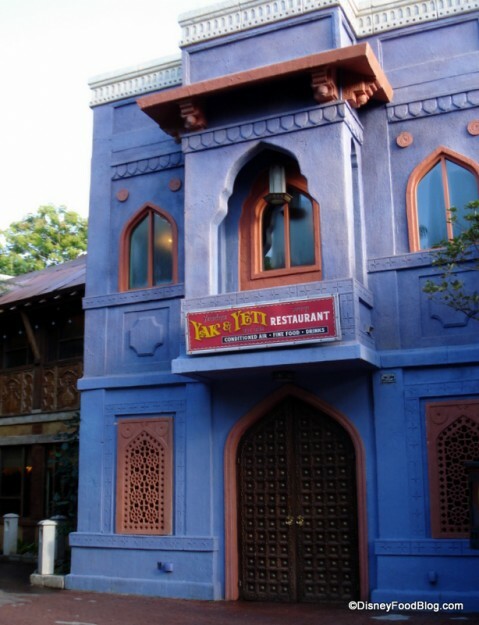 WE LOVED Yak & Yeti! Service was fabulous and everything we ordered was great! Thanks for the tip about the parades. We hate to stand and wait around for parades, this is a great option! We *heart* Yak & Yeti! We’ve never had a bad meal there. 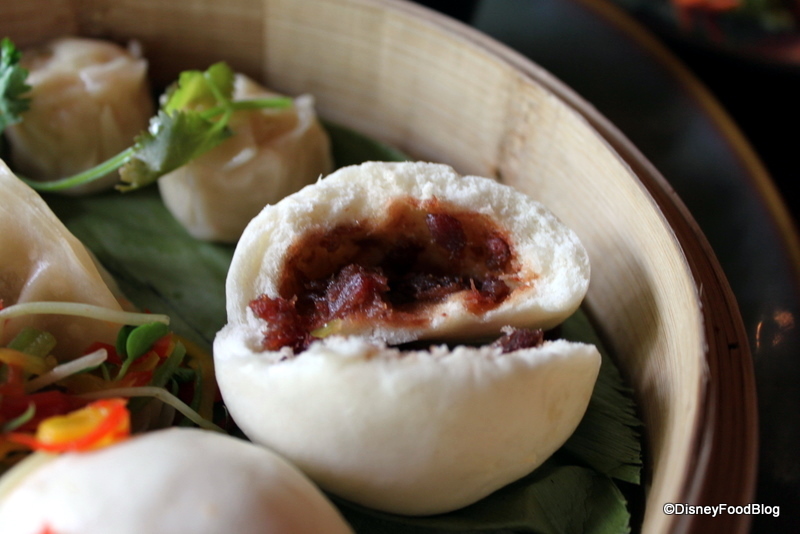 Your photo of the char siu bao makes me long to return!! We’ve had the dim sum basket before, and the char siu bao tastes just like the authentic ones I used to eat when I was growing up! Yak & Yeti is ALWAYS a must do for my family. My kids (11, 9 & 7) love the fried greenbeans and the pot stickers. My habds-down favorite – the burger with Asian slaw. As soon as I board the plane to MCO…I start dreaming about my burger. It is, by far, the best burger I have ever had and it is always great. Always! This past November, my husband and I found ourselves unable to get a table at the Tusker House, where we always eat lunch (we hadn’t made reservations because we were leaving our schedule open). 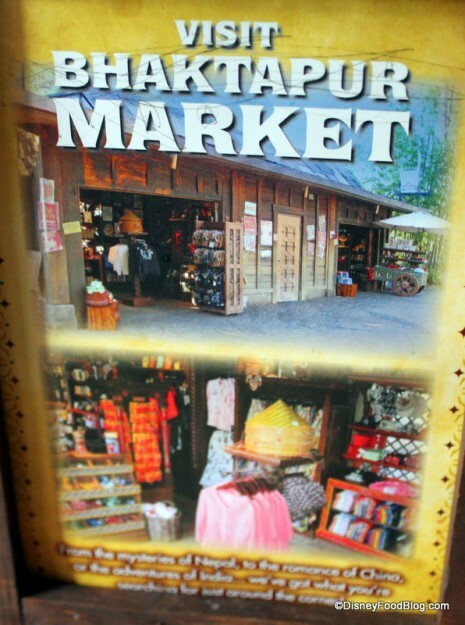 Disappointed, we wandered a bit and wound up walking by Yak & Yeti. We were SO impressed with the food that we’re still talking about it. I had the crispy honey chicken and LOVED it, my husband got the duck and we each got the fried wontons for dessert and devoured them. We’ll definitely return on our next trip. This is a must-do for us every time we visit AK. We sit at the bar and have a few drinks and apps. I always get the lettuce wraps- cool, fresh, filling and so delicious! It’s a great spot to get in out of the heat and re-energize for the parks. We ate there on 2/4/13 for the first time for lunch, the day this review came out, not knowing there was a review out that morning! One quibble with the review: The bright purple “house” is actually kind of dark purple. When we arrived for lunch, there was no activity near the front entrance of the building, which is between two large plantings. The place looks *small* because you only see what’s between the plantings. Only when you go inside do you realize it’s actually a large restaurant. The small apparent size, coupled with the lack of activity made us question whether we were in the right place. Our group of six loved the food and atmosphere, moreso than Tusker House and Rainforest Cafe, the other table service restaurants where we ate on previous AK days. The fried wontons are a definite “must have”. Love the skirt steak & shrimp. Delicious! I came upon your post while searching for a recipe for that dish. Those fried wontons are also yummy. 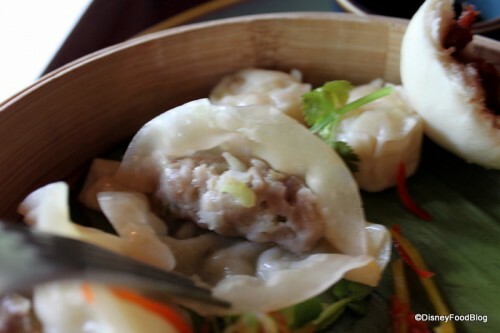 I really want to try those shrimp sui mai in the dim sum for two appetizer but everything else with it is pork, which I don’t eat. Is it possible to order just the shrimp sui mai by themselves as an appetizer?